Somehow this year, I’ve become quite fixated on making blankets. Just when I get finished on one, I’m suddenly making another. Mostly, I make them for the special people in my life. There’s really nothing like giving the gift of crocheted cosiness to let people know you care, right? 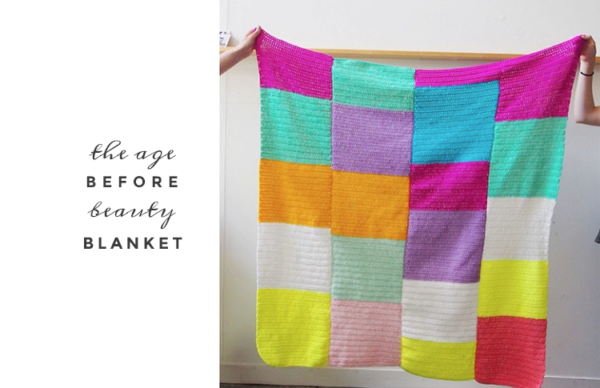 I finished the Age Before Beauty Blanket in January. You can find out how to make it here. I made this for myself – to celebrate my age. Each strip is made from 46 stitches – and that is how old I am at the moment. 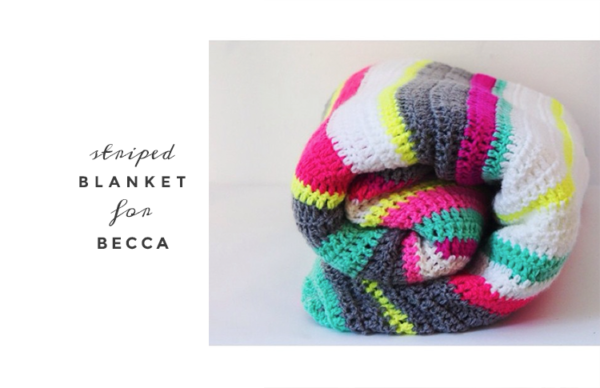 I made this striped blanket for Becca for her birthday. Becca’s boyfriend is my son Max. This blanket is a fun one to make. It’s just rows and rows of treble stitch (which is DC in the USA!) It is BIG and snuggly. Rin is my eldest kid. She’s 27 years-old. She doesn’t like colourful things (gasp!) That’s okay though because I made her a BLACK-et instead. It’s rows of granny stripes – made with a 5mm hook and 8 ply yarn. Too easy and super quick to work up! I made this blanket for Defah. Defah is one of my favourite ladies. It was really fun to make because I love mixing colours SO MUCH. I added a pompom for each member of her family (including the pup!) I think this is my second favourite blanket I’ve EVER made. This is my first. They’re neck and neck though. 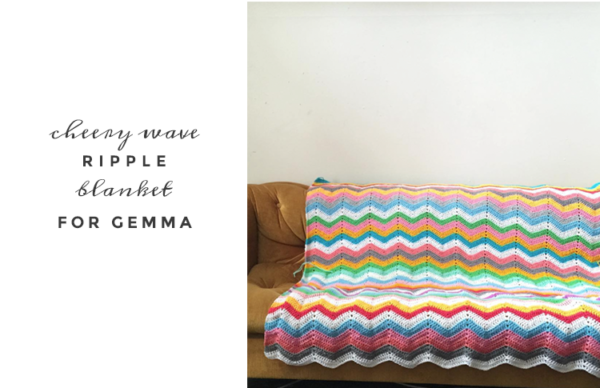 I made this blanket for Gemma. Gemma is my dear friend. It started off as a baby blanket (she’s having a baby!) but ended up a Mama-and-Baby blanket (because mamas need to stay warm WITH their babies, right?!) 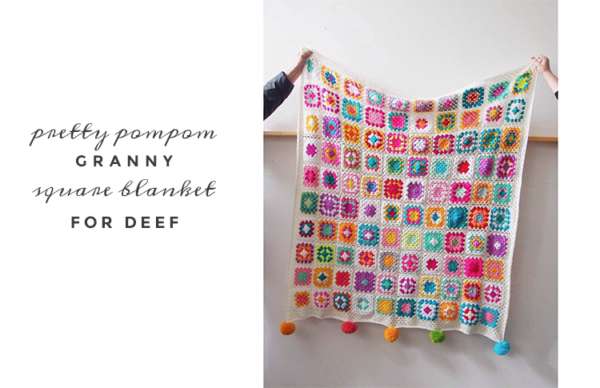 I’m making her a smaller blanket too, so that she has one to put in the pram… one that’s not HUGE like this one. This one would trail through puddles and get caught in the wheels. An extra smaller one made sense and two blankets are better than one, right?! 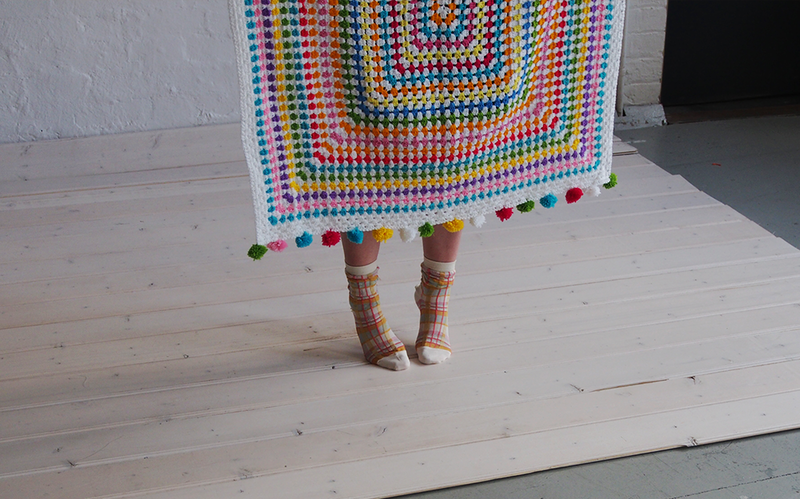 Here’s how to make this blanket. I am working on 3 other blankets at the moment. One is for Gemma’s baby. One is for my Nan. One is for me. I will show you those soon! I really like making blankets. 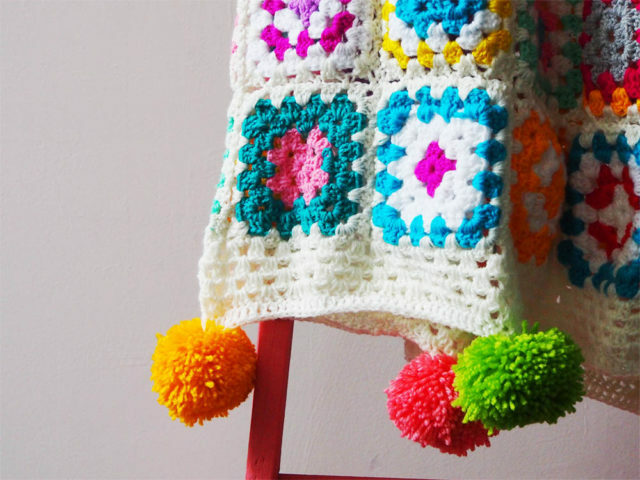 Note: The tip-top blanket – complimenting those cute Michelle socks – with the pompom edging is the one from Craft For The Soul. The pattern is in that book. I made that one just for ME. It’s in the window of our not-a-shop-anymore at the moment, showing off. I will stick with it then and get beyond the ‘scarf’ stage then – thanks for the encouragement! I saw that blanket today, in the window of your “not-a-shop” shop. I smiled, and stared at the pretty colours in your window display. So many snuggly blankets I really love them. There really is no better present. 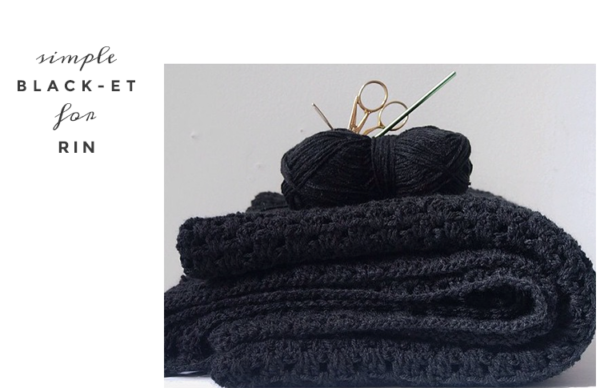 Making blankets for people you love is something so super special. I just finished a very plain chunky knit rug for my daughter Alice and took great delight in wrapping it around her and delivering a big hug. My dearest friend passed away early this year and I had made a beautiful crochet blanket for her when she was ill. I told her wee daughter (10) that when someone makes you a blanket you can have a hug from them at any time by wrapping the blanket around you and feeling the love. I have a book by Jan Eaton and I first used the pattern in there. Thanks for sharing, Pip! Love your use of color. Where on earth do you find neon yarn? You’ve done such an amazing job of turning what is considered to be an older craft fresh and new. It inspires me to get back into crocheting! I love that beautiful colourful one too, so much fun! I’ve been making lots of blankets too and have been going through so much yarn! Any tips for keeping the cost down? It really adds up making blankets! Hey Pip, which is the fastest to make? I want to make my dad one in a hurry and was thinking 6mm hook and 8 ply yarn. Do you think that would work? Would be very grateful for your advice. It’s cool when projects morph into a theme.